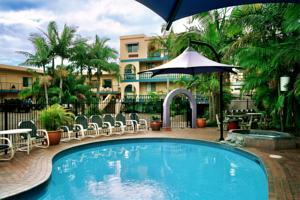 El Paso Motor Inn is located in the center of Port Macquarie. It features a solar-heated pool, a gym and spa. The Hastings River is a 5-minute walk away. All rooms at El Paso Inn feature free Wi-Fi, air conditioning and cable TV. Some rooms feature balconies overlooking the pool or a private, in-room jacuzzi. A daily breakfast is served at The Waterfront Restaurant. For dinner, contemporary Australian cuisine is offered. For guests who prefer open-air dining, barbecue facilities are available. El Paso provides free private parking. Some guests can also receive a complimentary pick-up from the train station or airport. Free! All children under 2 years stay free of charge when using existing beds. All children under 2 years are charged AUD 20 per night for baby beds. One further older child or adult is charged AUD 20 per person per night when using existing beds. There is no capacity for extra beds in the room. The maximum number of baby beds in a room is 1. Any type of extra bed or crib is upon request and needs to be confirmed by management. Supplements are not calculated automatically in the total costs and will have to be paid for separately when checking out. American Express, Visa, Euro/Mastercard, Diners Club, Eftpos The hotel reserves the right to pre-authorize credit cards prior to arrival.